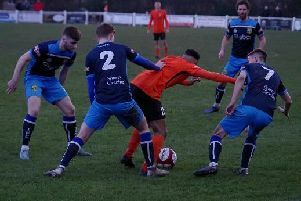 After three successive losses, a scintillating second-half display saw Tadcaster Albion return to winning ways as Bamber Bridge were thrashed at the i2i Stadium. Michael Morton’s men had netted just once in their previous four outings, but they re-discovered their goal-scoring touch and put five past their fellow promotion-hopefuls. There was little action worthy of note during the first period, Taddy number one Michael Ingham tipping two efforts around and over the woodwork and Casey Stewart seeing an effort ruled out for offside. The second 45 was a somewhat different affair, however, and it was the Brewers who broke the deadlock twelve minutes after the resumption. Stewart waited for an overlapping run from Aaron Hardy before rolling the ball to the full-back whose cross was right on the money allowing Aiden Savory to head into the back of the net. Stewart came close to doubling Albion’s lead when he cut inside a defender inside the box but saw his close-range strike well saved by Lloyd Rigby. Brig boss Neil Reynolds was clearly not impressed with his side’s showing as he made a triple substitution on 63 minutes. One of the players he sent on, Michael Potts, almost levelled proceedings immediately, however his strike from distance cannoned off the crossbar and away to safety. The Brewers were well on top by this point and causing their opponents serious problems, eventually doubling their lead, and deservedly so. Another subsitute, Hull City loanee Will Annan, picked up the ball from Savory’s flick-on before driving forward and shifting back to Taddy’s number 10 who fed Aaron Hardy and the defender cut inside a slipping Macauley Wilson and curled into the bottom corner. This goal sparked a quite extraordinary eight minutes which saw Albion torment their opponents with goal after goal. Annan, who was only making his second appearance for the club, picked the ball up deep inside his own half, and with encouragement from the watching on Taddy faithful, carried the ball confidently into opposition territory. From here, he jinked in-between two red shirts and took the ball back from Savory before reversing a shot into the bottom left-hand corner in sublime fashion. Things went from bad to worse for Bamber Bridge soon after as they were reduced to ten men, Wilson the man to be shown a straight red card for a wild lunge on Annan. Not to be deterred after being kicked, Annan continued his rise in popularity around the ground as he netted his second since coming on and the hosts’ fourth of the afternoon. Billy Whitehouse switched the play to Annan, who was on the far left flank and drove at the Brig captain Matt Lawlor at pace. The visiting man just could not handle him and Anna carefully pushed into the bottom corner with his left-foot. Taddy weren’t finished there either as they capped off their five-star second-half display with a fifth goal. Annan, on a hat-trick, received the ball in the box before dancing past a defender but opting to tee up right-back Harry Sheppeard who neatly bent into the back of the net. Victory sees the Brewers move up to seventh place and a play-off spot in Evo-Stik Division One North ahead of Easter Monday’s home clash with North Yorkshire rivals Scarborough Athletic (3pm).